The mighty Columbia River carves its way through the Cascade Mountains of the Pacific Northwest as it fashions much of the boundary between Oregon and Washington State. The Columbia River Gorge is rich in scenery from snow capped mountains to magnificent waterfalls. This is the backdrop for Union Pacific's Portland Subdivision between Portland, Oregon and Hinkle Yard. Many manifest trains make their way to and from UP's classification yard at Hinkle while expedited intermodal trains race between western ports in Portland, Tacoma and Seattle to major intermodal hubs in and around Chicago. With a gentle grade and many high-speed curves, this water-level route through the Cascade Mountains is ideal for long, heavy trains. Add the breath-taking scenery found along the gorge and you have the perfect recipe for great train watching. See UP's mighty SD90 MACs pounding the rails with 130 car potash trains! ES45AC's on the point of long double-stack trains! Vintage geeps in local service and much more, all in the spectacular setting of the Columbia River Gorge! Hueycrewman (Dulacca, Qld, Australia) on 2012-05-16 14:27:40. This is a DVD that I have been looking forward to, and I am not disappointed. 7idea have done it again. Easily one of the best Blurays that I have ever seen regarding trains or their locations. The style of filming and the location scenery make this a winner. Thank you 7idea for saving me a trip there. Trainnut (Manteca Calif.) on 2012-04-08 08:55:41. First off I must say that everything produced by 7idea is awesome!!!! 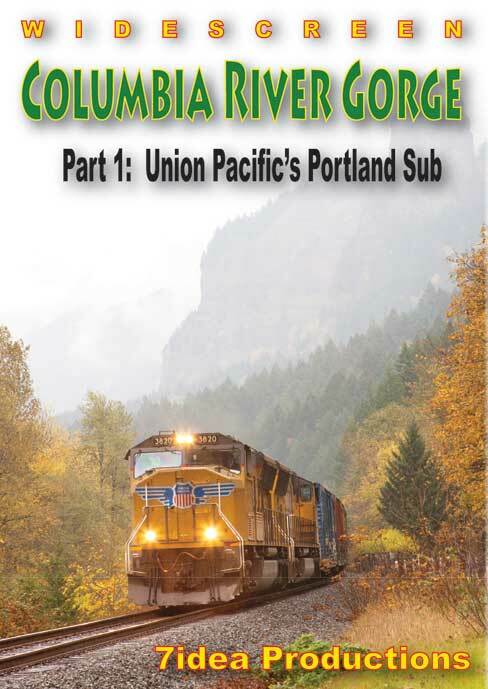 As you know the Columbia river gorge is a great place to visit for railfans or a train travlers too!! I for one love the locations and angles of locations that 7idea uses to give their dvds so much more than your average prodution of other producers!!! Great stuff 7idea !!! Keep them dvds coming!! Cant wait for part 2!!! a must have!Tell your friends about 7ideas dvds!!! Blu-ray is the best!!!! Choo Choo John (Colorado) on 2014-07-31 10:14:57. 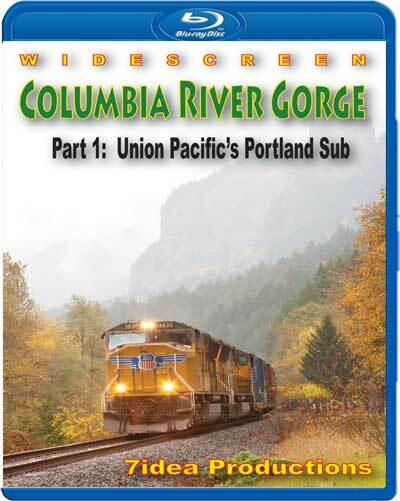 BOTH Blu-Ray DVDs of the Columbia River Gorge (Parts 1 and 2) are wonderful. What's not to like?? The action is powerful. The locations are highly scenic and varied. Great programs for the train watcher in all of us. Mysp7377 (San Diego Ca) on 2013-08-06 14:01:38. This is a great DVD that's nicely photographed has good & informative narration and excellent graphics. I liked this DVD very much along with volume 2 covering the BNSF. A nice verity of trains are seen on both volumes from intermodial and stack trains to manifest freights auto racks and coal trains along with locals powered by some nice older EMD geeps. There's some nice coverage on this DVD of four unit lash up's of UP's SD90Mac's hauling unit trains, both volume's 1 and 2 are a "must have" if you like lots of modern day main line action. EMD_GUY (michigan) on 2012-10-25 13:42:47. I bought this video mainly because of the reviews.I for one was somewhat dissapointed in the Video because it seemed as though the main focus was the scenery and not the trains.Some may like this video because of the scenery,but not me.After watching literally hundreds of train videos,this one just seems to be the same old thing,one run-by after the other,just like soo many other videos.My interest are in more of a Industrial background and operations,switching as opposed to mountains,etc. The overall production and clarity of the video is excellent!But if your not interested in the content,what difference does it make.Alot of the shots were to distant to keep my interest.I rather see the trains up close and personal than look at mountains,water,trees.